Cloigen Ruby is an imported bay mare by Rhoson Maori and out of Cloigen Rosie. Her bloodlines are heavy Menai and Downland breeding. She was imported as a yearling in 1998 and purchased by Sandy Costanzo of Brookside Stud. 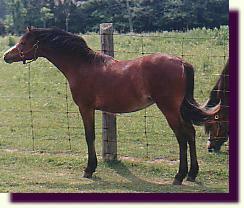 During my trip to Brookside Stud in 1999, I had the opportunity to see Ruby out in a pasture. I had come to Brookside to see a different mare and had no intention of buying two, but I was awestuck with Ruby's spectacluar movement, and knew immediately that Ruby would be an asset to our breeding program. And Ruby has been a wonderful broodmare for us. She has given us five fillies, one by Cloe Olympian and four by Sprocket. Because I have been incredibly thrilled with how well she crosses with Sprocket, she will continue to carry his foals. It saddens me to report Ruby passed away in the fall of 2008. Click here to see a list of Ruby's foals. Sommertime Opening Ceremony is from my first foal crop, before Sprocket was old enough to be a sire. 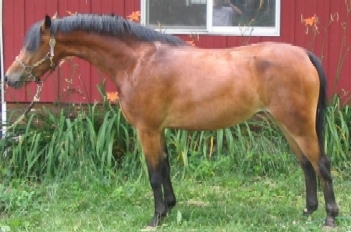 She is a homebred section B mare out of Cloigen Ruby and by Cloe Olympian. She has been shown on the line several times as a two-, three- and four-year old. In the fall of 2006, she was broke under saddle and I couldn't be happier about how well her training came together. I will forever be grateful to Mike Rees for his expertice in training Sara and proving to me that she has the brains and talent to secure her a spot as a producer of tallented foals. Sara is the first filly from Ruby, by Cloe Olympian. She has matured into a lovely mare and we have decided to keep her to be a broodmare, like her mother. If she crosses as well with Sprocket as Ruby has, we will be in for quite a treat! Click here to see more pictures of Sara's foals. 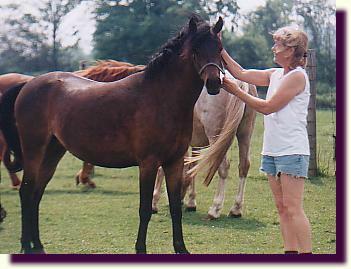 Zangi began as part of my breeding program to give me a single foal. I leased her so that I would be able to produce a Welsh/Arabian cross that could be double registered and shown in both rings. When her first foal was born in 2003, I liked him so much that I purchased Zangi even though she is a 1983 model! 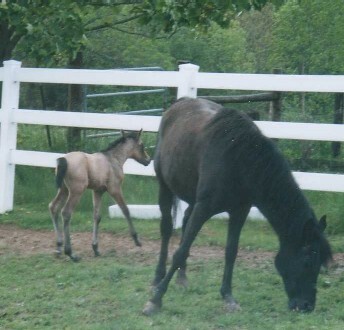 Zangi did give us one more foal in 2005, but that was her final one. We did try once more, but alas she is no longer able to maintain a pregnancy even with a great deal of chemical assistance. So, beginning in 2007, Zangi will begin her new career as "Sweet Aunt Zangi, keeper of the weanlings." Click here to see a list of Zangi's foals. 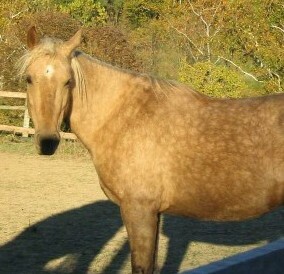 The Yellow Mare is a pony that I rescued in the winter of 2004. When she arrived at my farm she was scared, thin and very pregnant. She had very little human contact, as was evident by the fact that she had been halter broke only 24 hours before her arrival. I knew that it was going to be a long road to travel for me and this mare because I needed to gain her trust in time for her foal to arrive. I spent months of one-on-one time teaching her to lead and showing her that I would not hurt her. She spent her days going from our isolation stall to her paddock and back. I wanted to make sure she was approachable alone before she joined the herd. Finally, all of this hard work paid off because she is a joy to be around. I have wondered several times why I brought this mare to Ohio. I can’t breed her to my stallion because of the risk of throwing a double dilute, half-Welsh foal that hides the gray gene. I do not have the time and money to make her into a riding pony. I can’t even show her on the line because there is no chance of reuniting her with her papers. So why is this mare in my field? She lives here because I thought she deserved to live a life free of hunger and fear. She deserves to know love and kindness. As one of God’s creatures, she deserves a chance. That is why she is here. I know that she will spend her life without producing any foals or doing great things, but I like this mare and am proud to have given her a life here in Ohio. Click here to see a list of Yellow Mare's foals. Brookside Merit no longer lives with us, but I wanted to list her as a reference mare so you could see the babies she produced for us. Click here to see a list of Merit's foals.